The numbers, from ad network Chitika's research arm Chitika Insights, were drawn from a sample size of hundreds of millions of smartphone and tablet ad impressions from Dec. 1 to Dec. 27, 2012. Data was measured across the U.S. and Canada only. While Apple's iPad, including the iPad mini and older generations of the tablet, took a substantial 7.14 percent hit during the nearly month-long period, the device is still leading the space by a wide margin with 78.46 percent of all traffic. Next in line is Amazon's Kindle Fire, a reasonably priced offering from the internet sales giant that accounted for 7.51 percent of Chitika's web impressions in December. The device enjoyed the largest holiday boost with a 3.03 percent increase in marketshare, echoing last year's strong holiday performance. Coming in third was Samsung and its 7- and 10-inch Galaxy tablets, which managed to jump 1.38 percent to finish with 4.38 percent of the market. Google's Nexus 7 and Nexus 10 gained 0.92 percent to hit 2.04 percent of the total market, while Microsoft's Surface initiative continued to stagnate with a 0.17 percent increase to account for a 0.4 percent marketshare. The Surface is slowly catching up to RIM's defunct BlackBerry Playbook, which lost 0.02 percent to end the year with 0.68 percent. 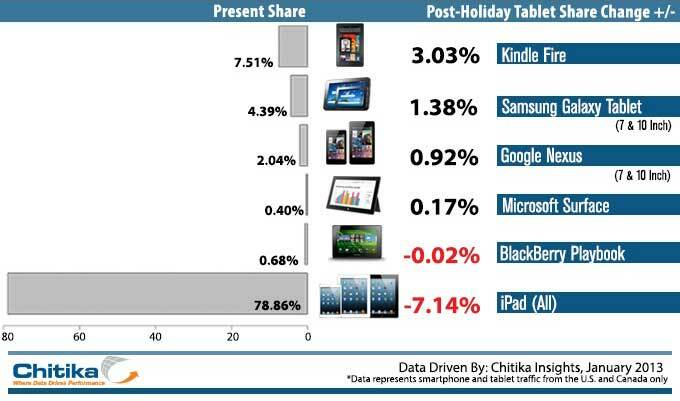 Despite the uptick in rival tablets, Chitika expects the iPad to re-enter the 80 percent range as users return from holiday vacations, though warned that total marketshare will not reach pre-holiday levels.